As I write it is Saturday, February 22, 2014, and this is the day a Requiem Mass will be said for the repose of the soul of Linda Buitendyk. As you will remember from a previous blog entry, Linda was a dear friend from St. Paul's ACC who lost her battle against brain cancer this month. On this particular day, family and friends have gathered at St. Paul's to pray for her soul's eternal rest in heaven. Following the Requiem Mass, a luncheon will be served in St. Paul's Fellowship Hall. This will provide an occasion for family and friends to celebrate the life and legacy of Linda. An opportunity to reminisce about how one was touched by Linda. Many are sure to remember Linda as the quintessential nurturer. We wrote previously about Linda's gifts for gardening and her skills in the kitchen. Those were gifts the members of St. Paul's were privileged to enjoy over many years. Many times we've consumed breads, cinnamon rolls, and other outstanding edibles whipped up by Linda and her crew. In point of fact, St. Paul's is blessed with several very good chefs. These individuals are gifted in the art of cooking and baking, serving, hosting and extending gracious hospitality. Over the years, many have gathered in St. Paul's Fellowship Hall to partake of these gifts. You can be sure, though, Linda's tasty culinary productions will be missed immensely. So, as I sit at the computer typing today, Linda is predominantly on our minds and in our hearts. Therefore, Bob and I decided February 22nd would be the perfect day for me to write in celebration of those who nourish so many through their cookery expertise and hospitality. In particular, the wonderful Mennonite ladies of Santiago, Costa Rica, whose cooking and baking Bob and I often enjoy during our winters in Costa Rica. As most of you know, we live among an established Mennonite community. These folks are known to possess many virtues. One is great hospitality and presenting wonderful meals for enjoyment. Indeed, a specifically worded search on the internet will reap several sites that herald the fine art of cooking/baking and hospitality associated with the Mennonites and Amish. It is an absolute certainty that Mennonites Girls Can Cook and that includes scrumptious baked goods. 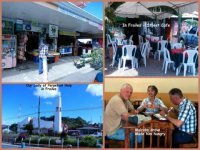 In the general Costa Rican community we reside is the Super Santiago Bakery which is operated by the Mennonites. The primary overseers of the Mennonite bakery are Gloria Yoder and her husband Issac. Gloria is the sister of our landlord. Gloria and Issac are gentle, beautiful people who are expecting to become first-time parents this coming April. Regardless, that does not interfere with Gloria producing some excellent baked goods or keep Issac from managing the Mennonite stall at the open air market, Feria, in San Isidro on Thursdays. 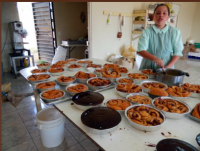 The Mennonites of Santiago also travel weekly with their delectable snacks and baked goods to the Ferias at Jaco and Quepos on the Pacific Coast. 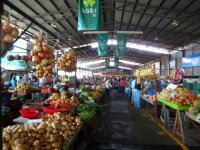 Those open air markets are Fridays and Saturdays. Those assigned the coast markets depart our community at 3:30 a.m. to arrive in Jaco in time to set-up and conduct business when the market opens. When the work is completed in Jaco, they set off for Quepos. 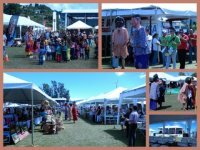 It is an exhausting schedule, but if they did not show up as expected, a great many folks on the coast would be disappointed; so popular are the Mennonites' goods. There is a troupe of lively young Mennonite gals who work Tuesday through Thursday at the Super Santiago sifting, mixing, blending, creaming, whipping, beating, kneading and whatever else it takes to produce the treasure trove of baked goods. They create and bake the yummies, wrap all sorts of tasty treats, clean the equipment, and keep the bakery tidy. It is a place that hums with cooperative effort and a pleasure to observe. Bob and I are frequent customers. A good reason we need to keep our hiking shoes active because those baked goods are not low cal. The bakers are energetic, sweet and hardworking. It is obvious their parents, with the Holy Spirit's guidance, are rearing extraordinary women. There are four young ladies who do the bulk of the work in the bakery. They are Carolyn Yoder, Paula Yoder, Abigail Hidalgo, and Keren Apuy. On unusually busy days, these four may also be joined by other young Mennonite gals to assist with the chores. That was the case this past week when the church was hosting a revival and they needed to close the bakery in a timely manner to attend the evening meetings. On Tuesdays the bakery concentrates on cookies and delicious caramel corn which goes along with other snacks they sell such as granola mix, nuts, and other crunchies. They also make butter, which Carolyn notes is not her favorite process. Wednesdays and Thursdays produce pies, cakes, and excellent cinnamon rolls. Paula Yoder told me she especially enjoys making the glazed chocolate cakes. I can testify that those cakes are delicious. Of course, they also bake breads and dinner rolls. You name it and they bake it. And, from the looks of it, Keren and Abigail are happy to collaborate in concocting all varieties of mouth-watering goodies. Gloria Yoder manages the special orders for birthday cakes or other celebratory desserts which she creates in her home kitchen. We've included some photos for you of the bakery and the open air market in San Isidro. Bob and I have a neighbor, Stan Kaufman, who is building in Santiago Springs. To date, Stan has had constructed on his property a spring-fed piscina (swimming pool) and a small cabina (cabin). When Stan has his main house built, the cabin will become a guest house. For now, it is his humble abode. In another writing, you will learn more about this fascinating gentleman from Berlin, Ohio. This particular entry, however, concerns bamboo and Stan's acquisition of 3 chairs for the cabina. Stan has been on a hunt for a table and chairs for his cabin and likes the dining chairs in our rental home. The furniture in our Costa Rica dwelling is all bamboo. One Sunday several of us were visiting after the Mennonite Church service and Stan asked our landlord Nat about the furniture in the rental model home. 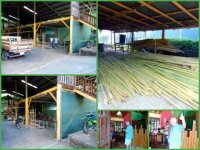 That's how we learned about Bamboo Costa Rica, not to mention restaurante Papá de Paramo. Nat explained to Stan that the furniture in the model home was designed and constructed at a place called Bamboo Costa Rica (we'll shorten to "Tico"). 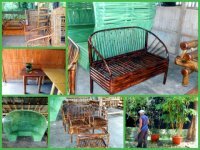 In fact, Bamboo Tico named a furniture series after the developers of Santiago Springs – Lecona. 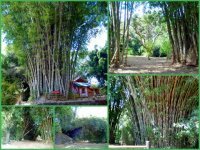 Bamboo Tico is in the foothills surrounding San Isidro outside the main proper of the city. We three decided to visit Bamboo Tico to see about chairs for Stan. Nat emphasized such a trip would be a good time to stop at Papá de Paramo for a meal as they were in close proximity and Papá would not disappoint our palates. Now, Bob and I happily take Stan along when we travel to San Isidro. Stan's main means of conveyance is a small motorbike and the local bus. Hooking up with us and our car is a much nicer ride for Stan. Indeed, that previous week we had already spent one full day with Stan in downtown San Isidro looking for furniture with little success. It seemed we were in for another shopping excursion with Stan that could prove to be quite interesting. The next Tuesday we set off for Bamboo Tico's armed with directions. Of course, having the directions didn't matter as we still got lost. Kudos to Bob who usually gets a tad nervous driving in and around San Isidro. (In fact, we all do with good reason.) 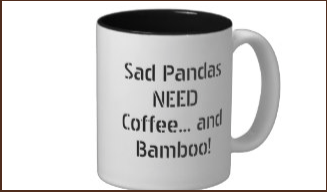 He kept his cool, avoided a couple of close calls, while Stan and I sorted out the directions and finally located Bamboo Tico's. In fact, once we were on the correct paved route, we passed some lovely homes which we surmised constituted suburbia San Isidro. We are accustomed to seeing Bamboo in Costa Rica. However, nothing prepared us for the stands at Bamboo Tico. The bamboo was everywhere and in all sizes. Some still in starter pots and others sporting several years growth. Others were cut and ready for construction. The only thing missing were the Pandas. While I took photos of the grounds and the furniture, Bob stayed with Stan in the office while Stan completed the purchasing of three chairs. BTW, Bamboo Tico is not your standard furniture shop. There really is no display room. You do see finished pieces around, but generally you order from a catalog. Lucky for Stan, they had the three chairs he wanted available to take that day. My photos will give you a glimpse into Bamboo Tico's and you can also visit the website for more information bamboocostarica.com/index.html. 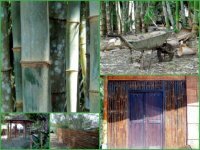 They provide a tutorial on the website about Bamboo that is quite interesting. Stan, Bob and I all agreed that purchasing furniture calls for a dining celebration. We loaded Stan's chairs and headed for the restaurant Papá de Paramo as was recommended to us. It is a boutique hotel with a beautiful swimming pool and a large open air restaurant. Surrounding the main dining area are numerous individual ranchos which are porch-like areas for dining overlooking the pool, gardens, and a river. The surroundings were very pretty and the food, as promised, was excellent. Another fine day in Costa Rica. 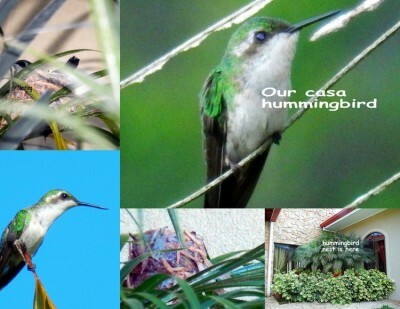 Just a quick update about our Casa Hummingbird. As I wrote in an earlier chapter, there is a hummingbird nest in a palm right outside our bedroom window. Two mornings ago the adult hummingbird flew into the house and spent an exhausting 30 minutes trying to return to the out-of-doors. We are including some photos of that excitement. Once outside, the little adult was away from our general vicinity for quite some time. We were concerned our fluttery humming friend had collapsed somewhere outside from cardiac arrest after the episode inside the house. Happily, in the evening, we saw the adult had returned none the worse for wear perched on a favorite tall plant overlooking the jacuzzi. We also checked the nest and spotted a very tiny beak and feathers. I was precariously standing on a chair to get a view using the camera lens. You can see a bit of what we saw in the photo we have included. This morning we looked out one of the sliding doors from the bedroom and what did I see? The smallest little hummingbird I've spotted yet. It looked as though the little guy was taking a practice flight and bumped into the side of the house. As Bob and I took photos, the adult hummingbird zoomed into our vision, chittering and hovering about, swooping in towards the chick. Then off the bigger hummingbird charged and shortly the tiny chick took off like a shot. These birds are fascinating. We are still trying to identify the species. There are over 300 from which to select. We are narrowing down as best we can to those particular to our location. It looks like the Andean Emerald, but we just don't know exactly. Chapter Five – Is this Paradise or the Local Swimming Hole? We can answer that! Yes and yes. On a recent Wednesday afternoon, the casa caretaker Bel and his sweet wife Xinia invited us to picnic with them at the neighborhood waterfalls. What waterfalls? Did they mean the waters rushing directly behind our rental house just beyond the scrub bushes? That is a lovely community area within the Santiago Springs development. It is a cleared area with two road bridges, two cement picnic tables and the entrance to the Friendship Trail, as named by the developer. We've hiked the trail along the two streams, climbing over the boulders in the streams, and sitting atop a rock to watch the water travel swiftly over giant granite. No, that is not the waterfalls...the waterfalls are farther down the stream. Bel and Xinia informed us that we need to hike through a neighbor's yard to get to this favorite neighborhood spot. Bob and I had no intention of missing this opportunity. We hiked a bit on a somewhat cleared path into the jungle area behind a neighbor's house just down the road from ours. As we walked, the sound of cascading waters became quite apparent. As we approached our destination, the noise was a roar. Suddenly, Bel pulled aside a few branches and we were at the base of a full-fledged waterfall. Who knew? We sure didn't, until that moment. We selected some rocks to stretch out on and Xinia laid the picnic. The good eats were wrapped in banana leaves. As you will see in the photos, it was a lovely presentation and Bob and I can tell you, it was very tasty. We also had wonderful sweet tea to drink. Shortly after lunch, we climbed to the upper portion of the waterfalls to take in the view and quite suddenly a crowd of teen boys gathered at the base of the waterfalls. Before we knew it, the young daredevils were scaling the rocks, sitting in the falls, sliding down nature's water slide (ouch), and jumping from the top into the swimming hole. There were shouts and yelps and laughter along with lots of splashing. Shortly, more folks arrived to frolic in another section of the falls. This was a group with younger children. I guess you could say they used the kiddie pool. I thought my next posting would be about the great afternoon at the neighborhood waterfalls. However, I've decided to write Chapter Four about why we are where we are in Costa Rica. From our perspective, we are in the best place in Costa Rica for our sojourn from Michigan's winter blast. Santiago Springs offers a slice of paradise, far from the madding tourist crowd. Yet, when we need a tourist fix, we don't have to travel far to get it. After all, Costa Rica is about the size of Kentucky, but without the road infrastructure we are accustomed to in the USA. But, hey, driving in Costa Rica is part of the adventure. In previous years, we rented a vehicle. However, because we are committed to wintering in Costa Rica, this year we purchased an auto from a local. This car purchase made a lot of sense, as vehicle rental for 2-3 months is pricey. When we return to the USA, our 1999 Toyota 4-runner (gotta have 4 WD) will be stored for us by local friends. On the other hand, bus travel is always an option. In fact, this year we traveled by bus from San Jose via the “mountain of death” to San Isidro where Nat Yoder met us with our car. Bus travel around Costa Rica can be exciting, and for some, may result in a queasy stomach. If you could see some of the routes traveled by these buses transporting folks around the area and to and from San Isidro, you would be astounded. Dramamine can become your favorite traveling companion. Grupo Lecona, which is comprised of our landlord Nat Yoder and his two very close friends Leland and Cory, in early 2009 began a development in Costa Rica called Santiago Springs. This development is in what is known as the Southern Zone of Costa Rica and we rent the model home. 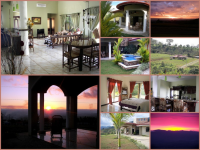 (If you are interested in an escape to Costa Rica, check out LeconaRealEstate and also Paradise Coffee Plantations. Also, there are 250 identified species of birds; sloths are here, monkeys, butterflies, and on and on. It claims one of the last great stands of untouched primary rain forest in the Central Americas. 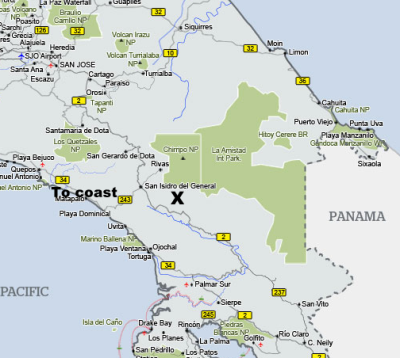 As noted on the map, our residence (X marks our spot) is not on the coast . It is tucked away in the foot hills of the Chirripo mountain in the Talamanca Range. Chirripo is the highest peak in Central America. We are also at the doorsteps of La Amistad Int'l Peace Park. We reside in and around three villages, Santiago, Hortensia, and La Colonia all within 40 minutes of San Isidro and 80 minutes from the Pacific. It is an idyllic place away from the frenzy (not to mention heat) of the city and the coast. From the front verandah of the model home, views of the valley are stunning and sunsets are spectacular. It is a short hike for us to a cascading river with lively waterfalls. We are surrounded by gregarious and gracious neighbors with four churches within walking/hiking distance. We choose to worship with the Mennonites. We can easily get to the neighborhood abastecedors for some groceries and because of our close proximity to the Mennonite community, there is easy access to the Mennonite bakery, the Super Santiago, where we are regular customers. (I'll have another posting about the bakery at a later date). Once we get to the Pan Am 2, we have nothing but pavement to the coast via Hway 2 and 243. Our particular route to the Pacific is full of twists and turns, ups and downs, and a feast for the eyes. Of course, and hopefully, the driver generally misses the scenery, but passengers are all Oohs and Aahs! Before we know it, we arrive at the gorgeous, albeit HOT and humid, Pacific Coast. Bob and I are blessed to experience Costa Rica. We are getting to know so much about the locals and meeting very interesting folks, many of whom are expats from various countries. Some of whom are making their residency in Costa Rica permanent and others who are in Costa Rica anywhere from 2-6 months. Whether we are planted right at the casa for several days in a row, traveling to San Isidro or to a friend's, or some other local adventure, or going on overnights to more distant Costa Rica locations, every day is an adventure and a gift from God. 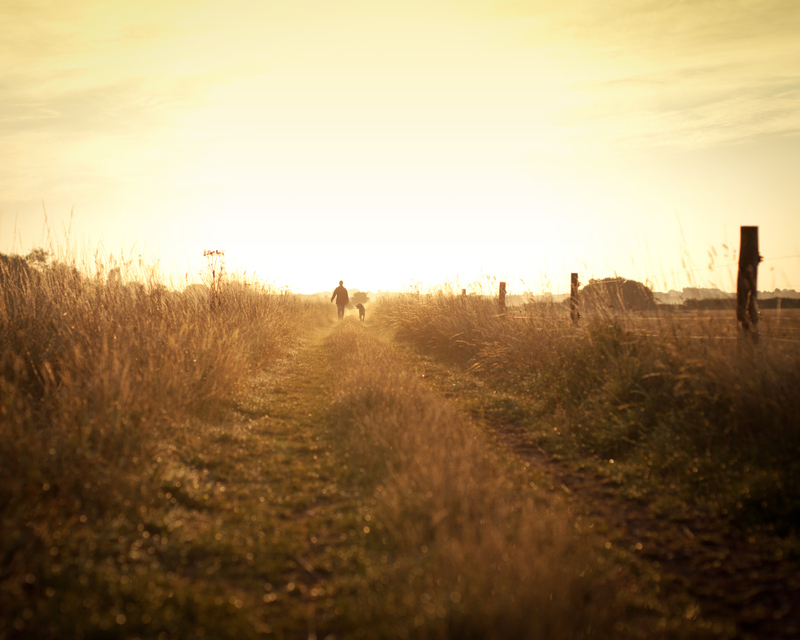 In truth and in our old age, we come to know and appreciate that life is an adventure. 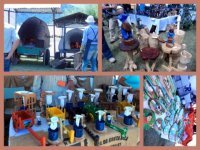 We want to share with our readers about our time at la feria del cafe de Frailes (the fair of the coffee of Friars). This particular outing was in the company of Malcolm and Angela Wright. You will recall the Wrights are our friends from England who own the Costa Rican Finca where we recently enjoyed picking coffee berries with Malcolm and his crew. We headed out early January 18, 2014, on the Pan Am 2 Highway, traveling the so-called “Mountain of Death,” toward San Jose. Bob and I were grateful that Malcolm offered to drive. Malcolm has more experience driving this route and Bob dreads navigating this portion of Pan Am 2. We were driving to the city of Frailes (Friars) in the canton of Desamparados (The Abandoned or Homeless) located in the San Jose Province. 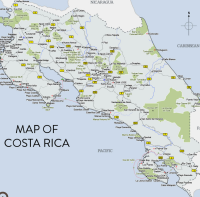 Point of reference: I equate a “canton” in Costa Rica to a county in the USA and a “province,” in my mind, is comparable to a state in the USA. Desamparados is the name of a canton and also a city in the canton. As a side note of interest, the name “desamparados” strikes me as sad. I researched a bit and learned that in the early 1800's it was a village named Dos Cercas (Two Fences). There is also a claim that this particular location is the site of the lost city of Garcimunoz, founded by the Conquistadors in 1561. The Frailes area developed when visited by groups of religious Franciscan Friars, who rested for a short time in this location, when enroute to Carthage (Cartago). The drive was not bad by Costa Rican standards. Always a few daredevils traveling this highway, but generally it was not as harrowing as other times for us. The scenery is gorgeous along this route (pretty true on most every route in Costa Rica). Frailes is located on a small plateau as a spur in the hills of Bustamante. The surrounding area consists of beautiful green hillsides that slope to the Candelaria River and many of these hillsides are loaded with coffee plants, citrus, avocados, peaches, and blackberries, and of course, assorted livestock. This area is fertile and vibrant. Also, the temperature is very pleasant, not at all sweltering. We arrived at Frailes de Desamparados (Friars Homeless) around 9:30 am. Luckily, we beat the crowd. It was obvious a good portion of the town residents participate in the logistics of the event. The streets were lined with welcoming, smiling folks ready to assist. We knew we were in for a terrific day. The above pretty much sums up the grand theme of the Fair. Of course, we didn't get to enjoy everything described; but we took in quite a bit in one day. The actual area for the main activities was lovely and well laid out. I would say perhaps the size of a football field. Clean, tidy, and colorful. The entertainment was great fun. We were not there long enough to enjoy the Folkloric dances, but we did have a lot of fun watching a very engaging and talented clown. He was center stage for at least two hours and a lot of fun for the children as well as the adults. Bob and I were also glad to learn more about the roasting of the coffee and cupping. We are now further inspired to consider taking a course in the states offered by the roaster of Church Grounds Coffee. It is a 3-day barista training course which includes the basics of coffee, origin, where and how it is grown, processing of coffee, roasting, grinding, and brewing, and menu selection. 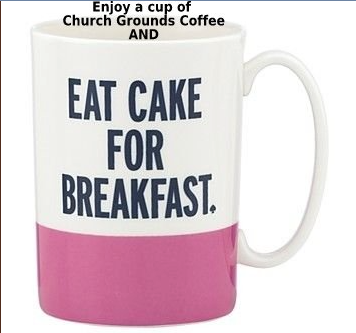 It occurs to us that such a course would be quite beneficial as we continue with our Church Grounds Coffee endeavor. 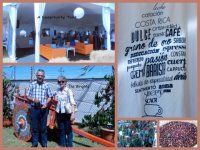 Please enjoy our photo collages of our day at the Coffee Fair. I've also included a map for your reference. It provides approximately the location of the rental we are calling home in Costa Rica as well as where Frailes is located. I'll let the pictures give you the rest of the story. Suffice to say, it was a great day. Pura Vida! Recently friends of ours in Costa Rica had guests, a cousin and his wife, visiting from the USA. Prior to their arrival the cousin's wife wanted to know if there are bugs in Costa Rica. One can assume she meant the real creepy, crawly tropical types. If you know the tropics, the answer is pretty easy to determine. However, in our rental home and the other homes we frequent in Costa Rica, the nasties tend to stay outside and those infiltrating the house, don't live long. In fact, in our Costa Rica residential area, during the day our doors and windows are wide open, most without any screening, and we experience little trouble from crawlies or winged critters. Indeed, we are seldom pestered by bugs even on our many Costa Rica hikes. Obviously, if you venture into the Jungle or deep Costa Rican Forest, you are wise to protect yourself with a strong repellant boasting a high Deet percent as an active ingredient. And, you are wise to watch your stepping to avoid disturbing other types of nasties who may be slithering on the ground. Some of those types can do serious damage to a body. That is my segue into my general theme for this post. Thought we'd share a bit about some of the critters we encounter on our hikes around Santiago, Costa Rica, where our casa is located. You will see for yourself, it is pretty tame stuff. 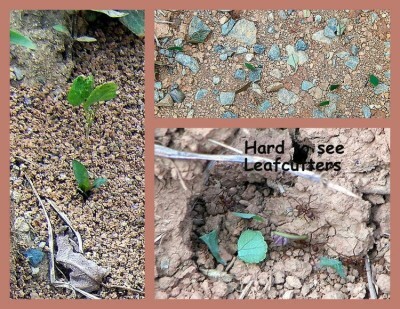 When we hike, we frequently come across the Leafcutter ants (Atta cephalotes) and in Spanish they are Zampopas. These little guys are found throughout Central and South America as well as some of the southern states in the U.S. We watch them marching about on the hiking trails. They form a neat little conga line carrying on their backs pieces of a leaf. Envision an odd type of snail. What we are observing are gardeners hard at work. These ants cut and process, by grinding to a pulp, leaves, flowers, and grasses to create a fertilizer needed to grow their actual sustenance. A particular fungus is their food of choice, therefore, to sustain their colony, they must be diligent farmers in order to grow their fungus. I've read that Leafcutter colonies, next to humans, form the largest and most complex societies on earth. And, I've been told by the locals that a Leafcutter bite is painful and best not to irritate the little farmers. We have a hummingbird nest in a palm growing against our rental home. This bird is tiny, dainty and highly protective. I'm not quite sure its exact tag, perhaps it is a Ruby-Throated although I cannot detect the single reddish feather at the throat. The nest is being guarded with gusto by our hummingbird. When we invade too closely, we are told to back-off in no uncertain terms. The warning chittering is unmistakable and might also come with some zipping wildly about by the hummingbird. Our friend and casa caretaker Bel informed us there are eggs incubating in the nest. We will watch with fascination, but from a respectable distance. However, even when I'm soaking in the hot tub, our little hummingbird keeps a wary eye on me perched on one of the palm plants surrounding the tub. Before swooping back to the nest, the bird will “buzz” me closely, I suppose to remind me of my place. Speaking of birds, because our doors are wide open during the day with no screening, an occasional bird will pay us a visit. They seem to know immediately they have entered the twilight zone and begin frantically seeking a way back to their normal habitat. Oftentimes, they become exhausted and sit a spell. In fact, you will see from my photo one such winged friend rested on the laptop. 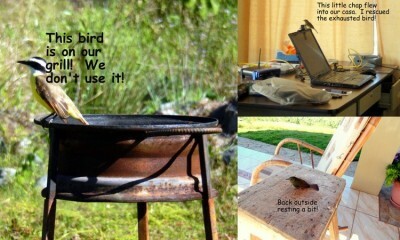 I rescued the bird and placed it outside to recuperate. We see horses daily about the area as they are a major form of transportation on the mountain roads. 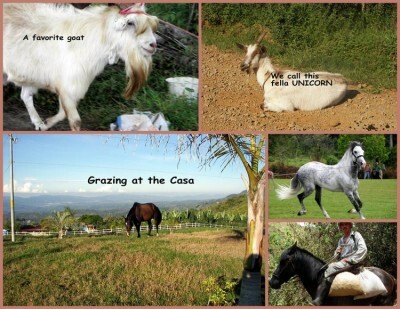 In fact, there is one local horse in Santiago that enjoys occasionally grazing in our rental home's yard. At some point the owner realizes the horse has escaped and comes to collect the animal. We also have a couple of favorite goats in our neighborhood. They are fun for me to photograph. One might be trying for a gig on Duck Dynasty by his appearance and the other old goat has one horn. Recently, we've had to chase a mama cow and her little bull calf. Lately, those two have been escaping their home pasture down the road and visiting the grasses surrounding our casa. When they look as though they might just invite themselves inside, we get after them and wait patiently for the owner to corral them. However, my favorite larger livestock in Costa Rica are the Brahmas. We always see the Brahmas in the mountain pastures on our hikes. They are quite striking, muscular animals and as we walk past, they often look at us as though we are the ones on display. They appear to be deep in thought about us and our antics. In fact, when they notice our appearance on the road, they will make sure to arrive at the edge of their barrier to observe our passing up close and personal. I have a habit of stopping and chatting them up a bit. I think they are telepathic only. They never utter a word, but seem to hang on my every word. I think it is time to conclude this tale of Costa Rican Creature Comforts. When I revisit this subject, I'll post a bit about the more unusual tropical creatures we encounter. As I am writing today, it is two weeks past since our arrival in Costa Rica on December 31, 2013. We have reconnected with most of our Costa Rican companions, native as well as the expatriots from various countries. After many holas, hugs, kisses, and 'we've missed you' salutations, we are taking comfort in our tropical mountain lifestyle in southern Costa Rica . 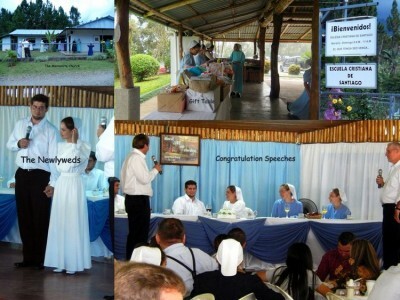 During our first week of 2014 in Costa Rica, we attended a Mennonite wedding ceremony and reception on Tuesday, January 7. The bride is Costa Rican and the groom is from Hutchinson, Kansas USA. They met doing mission work in El Salvador. The celebratory occasion was held at a lovely Rancho -- comparable to a USA wedding held in a park - with a well-appointed, equipped shelter. It was a pleasant, enjoyable experience for us. The bridegroom's family possessed little ability with the Spanish language. In comparison, Bob and I almost felt like we had advanced to the intermediate Spanish language skill level. (Okay. That is a stretch, but we are improving.) Consequently, it was good news in that the event was presented in both Spanish and English. The bad news, it did get a bit lonnnng in the humidity, but never boring and well worth the time. It was interesting, meaningful, and fun. The wedding luncheon was excellent and the congratulatory speeches enjoyable. Our first week concluded and we are all smiles. Besides the wedding, we hiked and became acclimated in our favorite winter residence. It is a blessing from God for us to be able to return to Costa Rica for a few months of living. On Tuesday, January 14, we traveled past Fatima, Zapotal, and beyond San Jeronimo de San Pedro to Finca Piedras Grandes (rough translation: Estate or Farm Large Stone). In fact, our destination was the last electric out-post up that particular mountain. The electric on that route ends at the finca. 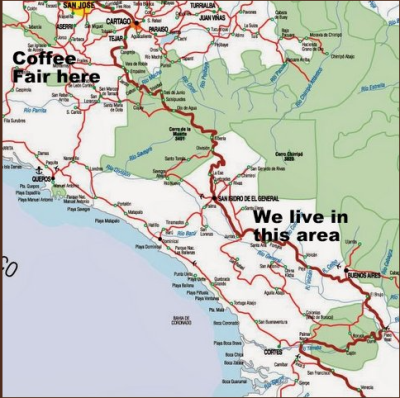 The Finca Piedras Grandes is owned by our Brit friends Malcolm and Angela Wright. 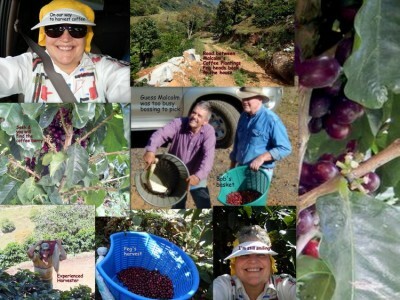 Malcolm invited us to assist him and his hired hands to harvest the coffee cherry. It was the third and last picking for the current season so all the coffee cherry, fully mature or not, had to be picked from the plant. The third effort is a delicate picking process because new buds are forming on the plants for the approaching growing season and must be minimally disturbed. Also, the pickers must take care to leave no bean cherry droppings on the ground. Droppings are an invitation to various unwanted problems with the soil and the coffee plants. The basket used by the harvesters, which Bob and I also used, is approximately one cajuela (approximately 12.5 kg) of coffee cherry. Costa Rica's unit of measure for compensating the pickers is a “cajuela” which is derived from “caja” and means box. Icafe, the Costa Rican Coffee Institute, sets a standard price for a cajuela, but the individual producer determines what to pay his harvesters. Let's just say, if Bob and I were expecting to be paid, we did not make enough to buy a cup of coffee. Bob and I are in our late sixties and we can report that picking coffee is not a great job for old bones no matter how fit one thinks they are. However, attempting this activity is a good endorsement for keeping fit. After several hours of picking, an arduous task and awkward to accomplish, we deposited our harvest and took leave of the chore. Malcolm, Bob and I started at 7:30 a.m. and stopped at 11:30 a.m. The hired workers had been in the plants picking at 5:30 a.m. and were still at it when we left the finca around 1:30 p.m.
“What on earth could be more luxurious than a sofa, a book, and a cup of coffee?” Anthony Trollope, a successful and respected English novelist - Victorian Era.